Georgia® athens waterproof Wellington work boot is the work boot you've been dreaming about. 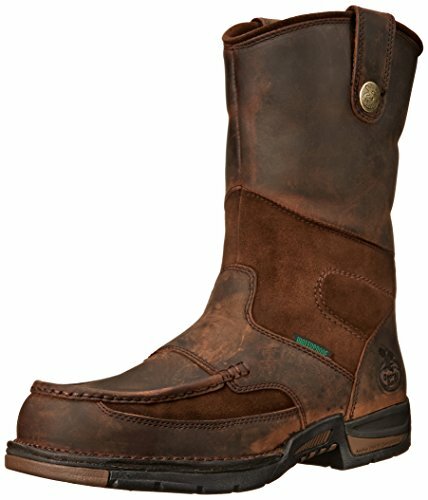 Made with Georgia® waterproof system, this brown work boot is incredibly comfortable and strong. The men's work boot stands 10 inches tall and has a 15 inch calf circumference (shaft height and circumference may vary by size.) created with an eva midsole and a rubber outsole, this pull on work boot will keep your foot very comfortable. Not to mention it has an amp (advanced memory polyurethane) footbed and a TPU shank for support. Need more support the men's waterproof work boot comes with an anchor disk by Georgia®.